Being in love with True Blood and having plowed through the Sookie Stackhouse books, I figured it only made sense for me to follow those reviews with Becca Wilcott's Truly, Madly, Deadly: The Unofficial True Blood Companion. But when I started reading TMD I became worried I would hate it as it seemed bent on deconstructing the idea of vampires. I'm not sure when but somewhere between university and attaining so-called adulthood I grew to despise all things over-analytical, nit-picky, and pretentiously intellectual. I like my vampires visceral and enigmatic, thank you very much, not as an exercise in intellectual dissection. For a moment it seemed as though TMD was heading into murky territory. But I'm happy to say that TMD is smart, thoughtful, humorous--an overall enjoyable read with none of the cringe-inducing doucheyness I was worried about. And I'm not just saying that because I'm mentioned in the book (ahem, check out page 165). The book is packed full of information, some of which was unexpected, which made for quite a few pleasant surprises and thought-provoking moments. There are bios and interviews featuring various fans, writers, bloggers, and lifestyle vampires, as well as the show's actors, Alan Ball, and Charlaine Harris herself. Pam fans (represent!) score with an exclusive interview with Kristin Bauer van Straten (back when she was still Kristin Bauer). Possibly less exciting is the exclusive interview with Patricia Bethune (Jane Bodehouse). Chapters include "The Pleasure and Pain of Alternative Lifestyles" and a fascinating exploration of HBO's viral marketing campaign for True Blood's premiere (I wish I'd started Blood Lines back then). There's plenty on the pop culture politics of the show, especially the LGBT connection. I was also thrilled to see an entire chapter ("Being Bad Never Felt So Good") devoted to the opening credits, including the producers (Digital Kitchen) and songwriter Jace Everett. I'm a huge fan of the opening sequence (as anyone who's read my TB reviews will know) and "Bad Things" and it's good to know I'm not alone in my appreciation. A major portion of the book is devoted to episode synopses (seasons one and two only), along with quotes and interesting facts. While there are some compelling insights and opinions expressed here, I kept being distracted by the silly names of the sub-categories (e.g., "Relationship Crypt Falls" and "Paging Dr. Creepy"). Vampires might value puns but, as Sookie demonstrated, humans not so much. Also annoying to me were the (thankfully few) bits where the author speaks directly to (or as) the characters. TMD's weakest parts are when it, like a comedian who feels the need to always be "on," tries too hard. The other weak part is the chapter on the TB Twitter roleplayers. I think unless you're part of the roleplaying (which I'm not nor have any desire to be) it's less than fascinating stuff. Unfortunately the author spends a fair amount of time on the Twitterers, including quotes by and interviews with the players in character. I found the quotes awful and the interviews simply unreadable. Here's a handy tip, guys: we already know what the characters sound like--do not torture us by writing in dialect. There's nothing more annoying than trying to read phonetic spelling. Seriously. Luckily TMD doesn't stray from form too long and returns to the far-more enjoyable interviews with writers and fans. I especially enjoyed the "Interview with a Sympathizer" highlights gleaned from the author's website. It's always good to see what other people have to say about a topic so dear to my heart, even when I strongly disagree with their viewpoints and have to suppress the urge to yell at the book. I would be remiss if I didn't also mention the numerous photos, both black and white and glossy colour, of the cast, fans, and sets. The author did not skimp on tantalizing details when she put this book together. I think TMD qualifies as essential reading for any True Blood, Alan Ball, or Charlaine Harris fan. When I finally reached the end of the book I was sorry that there wasn't any more to delve into. I hope Becca Wilcott has future editions planned (seasons 3 and 4? ); I'll be right there to get my copy. I'd also like to take a second to thank Becca sincerely for including me and Blood Lines in TMD. My labour of love suddenly seems so much more worth the effort. Cheers! Becca Wilcott: "You want an ideal coming-of-age metaphor, stick to werewolves and witches. But leave me my deepest, darkest vampires. To be precise, that which is not seen, not surface, and not freakin' sparkling." 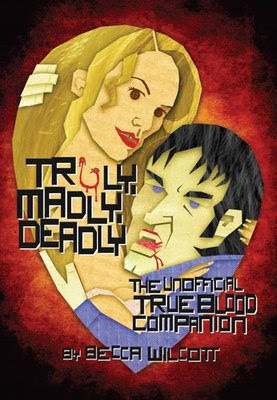 Truly, Madly, Deadly: The Unofficial True Blood Companion by Becca Wilcott. From ECW Press.